Does your garage need some TLC and decluttering? Do you have files you no longer need but don't have time to shred all the documents? I have good news for you! My office is hosting our annual FREE recycling event Saturday June 11th, from 10am – 2 pm. Bring your recyclable items (working or not) to this event. All recycling services are free! Any electronics (working or not), whole or parts — Computers & Parts, Printers, Fax Machines, Phones, Record Players, Speakers, Radios, Game Systems, VCRs, Christmas Tree Lights, All Appliances, Car Batteries, Computer Batteries, Medical Equipment, Ink Toner & Cartridges. The recycle event will be in the Windermere Real Estate/Mercer Island parking lot at 2737 77th Ave SE, Mercer Island. 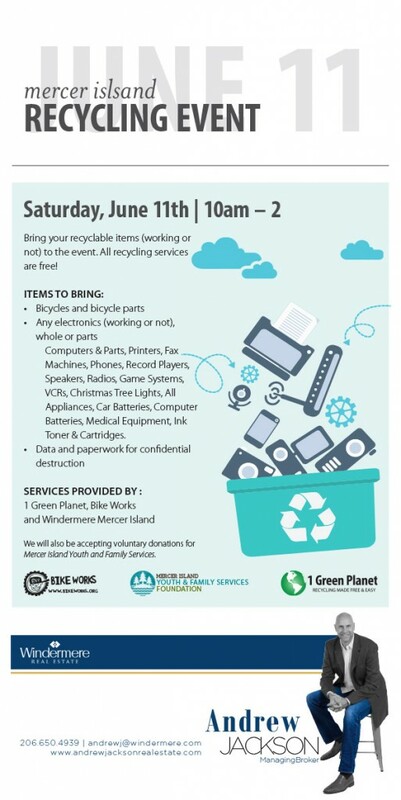 There will be a station to drop off your old appliances and electronics, a station for the bikes and bike parts, plus a shredding truck on site to securely shred your paper documents. If you have any questions about the event and what you can bring to recycle, please email me at andrewj@windermere.com. We will also be accepting voluntary donations for Mercer Island Youth and Family Services, our Windermere Foundation grant partner.